Moist, rich, acidic, well drained soil. Mixed forests. Partial shade to partial sun—very shade tolerant. 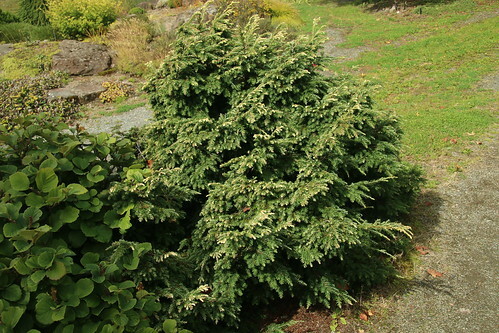 This is a slow growing, long-lived, medium-sized, coniferous tree. It rises on a single trunk from a shallow, wide spreading root system. In Minnesota mature trees are usually 40′ to 60′ tall and up to 24″ in diameter at breast height. In other areas individuals can reach 98′ in height and 40 ″ in diameter. The trunk is tapered, straight, and distinct to the top of the tree. The crown on younger trees is dense and broadly cone shaped. The slender leading shoot at the tip of the crown droops in the direction of the prevailing wind in the spring, but usually straightens out later in the year. On older trees the crown is uneven and the branches are irregularly spaced. The branches are slender and horizontally spreading with drooping tips. Dead branches remain on the lower trunk for years. The bark on young trees is reddish-brown to purplish-brown; thin; and broken into thin, roundish or irregular scales. On mature trees the bark is reddish-brown to gray and thicker. The scales are thicker and are broken into vertical ridges and furrows. On older trees the bark is thick with deep furrows. The ridges are often broken horizontally into irregular blocks. On mature and older trees newly exposed bark is reddish-purple. First year twigs are greenish- or yellowish-brown and densely hairy. Older twigs are brown or grayish-brown and hairless. The twigs are slender and flexible. They are rough to the touch due to a forward-pointing, peg-like projection at the base of each leaf that persists after the leaf has fallen. Side branches on the twigs are arranged on a flat plain. The buds are egg shaped, rounded at the tip, reddish-brown, non-resionous, hairy, and 1 ⁄16″ to ⅛″ long. The leaf scars are raised, forward facing, rough, and reddish brown. The needle-like leaves are alternate and evergreen, remaining on the twig about 3 years. They are attached to the twig on a short, thread-like stalk (petiole). The petiole is twisted or bent causing the leaves to appear two-ranked. Each leaf is linear, flat, flexible, and ⅜″ to ¾″ long. Unlike a spruce leaf, it will not roll easily between thumb and forefinger. It is rounded at the tip and at the base. The upper surface is shiny and dark green. The lower surface is similar but with a row of tightly-spaced white dots on each side of the midrib. Each white dot (stomate) is a pore surrounded by two glaucous guard cells. 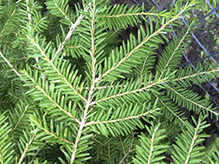 When crushed, the leaves emit an odor similar to the herbaceous species hemlock (Conium). Male and female flowers are borne on the same tree. Pollen (male) cones arise from clusters of yellow flowers in the lower part on the crown. They rise at the end on a greenish-white scaly stalk from leaf axils near the end of second-year branchlets. The cones are globe shaped, yellow, and about ⅜″ in diameter at maturity. In Minnesota they shed pollen in May or early June, about two weeks after leaf buds burst. Female cones hang downwards singly at the tips of second-year branchlets in the upper part of the crown. They are ⅜″ to ¾″ long, ellipse shaped when closed, egg-shaped when open. The scales are thin, egg-shaped to wedge-shaped, 5 ⁄16″ to ½″ long, and ¼″ to ⅜″ wide. They are rounded at the tip and project outward. Female cones reach full size in late August to early September, open in mid-October, and remain on the tree for more than a year. The seeds are small and have large wings. Seeds are dispersed throughout the winter. Sources: 2, 3, 4, 5, 6, 7, 8, 24, 28. The sighting in Crow Wing County is at the Northland Arboretum in Brainerd. Arboretum plants are not normally included in the range maps. In this case, however, the sighting is on a The Nature Conservancy sight, Paul Bunyan Savanna, which is a part of the Northland Arboretum. The sighting in Washington County is at Carpenter St. Croix Valley Nature Center. It was probably planted by the original owners of the property along with many other trees not native to the area. The champion eastern hemlock in Minnesota is on private property in Brainerd, in Crow Wing County. In 2016 it was measured at 58′ tall and 87″ in circumference (27¾″ in diameter). A minute, epidermal pore, surrounded by two white guard cells, that allows the exchange of gasses and water vapor. The guard cells control the size of the opening. Plural: stomata. 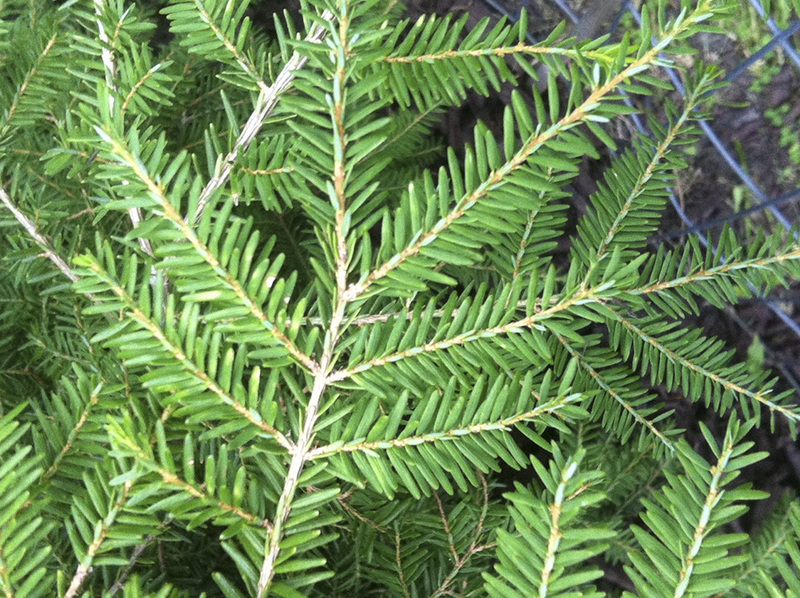 Krik of Black Owl Outdoors identifies and explains some of the characteristics of Tsuga canadensis, or the Eastern Hemlock.